2- 9/16 of an inch. 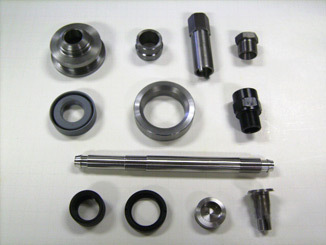 All of our machines are equipped with through spindle long parts attachments. Our CNC Swiss Machines are capable of long turning lengths and diameters up to 1.25 inches. Material is supported close to cutting tools, the head stock chucks the material and passes it through the guide bushing. This results in close tolerance (.0002) and holding surface finishes to eight micro. Materials that we typically work with include a wide variety of stainless steels, steels, titanium, brass, aluminum and plastics.